Before following the import process, you'll need to do a one-time configuration and "mapping" of your data to tell TOTAL which of your source fields should be imported into which of TOTAL's comp grid fields. In the future, you'll be able to simply re-use the mapping you create here. 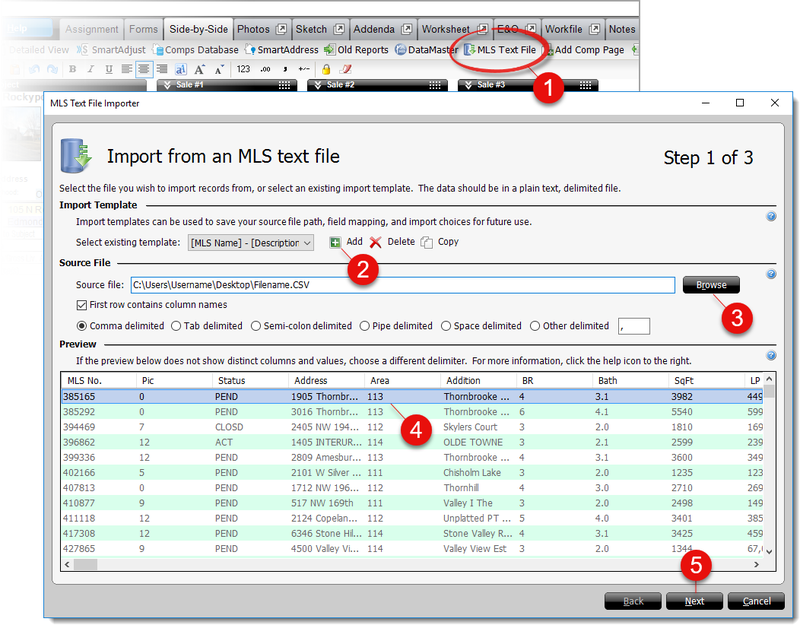 In the Side-by-Side PowerView, click the MLS Text File ( ) button on the toolbar. Now, click Add to create a new MLS Import Template. Next, click Browse to select the source file you downloaded earlier from your MLS. Once you've located and selected your source file, click Open. Verify that your source data displays correctly in the preview at the bottom of the screen. Adjust the delimiter if necessary. Finally, click Next to start field mapping.